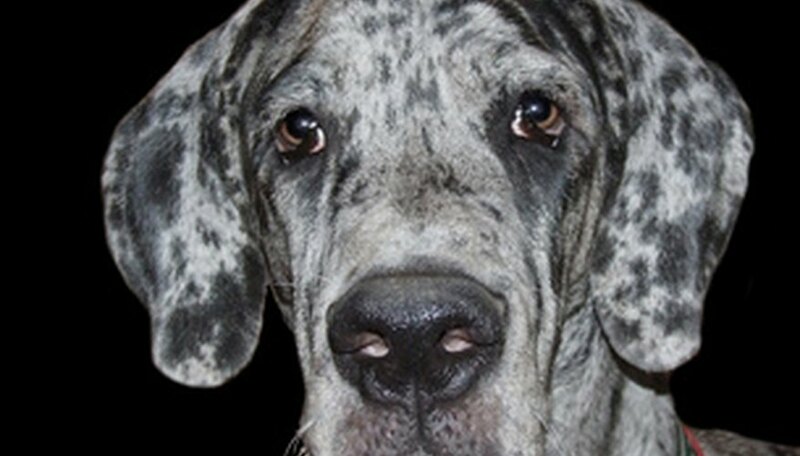 Not every dog owner is going to keep his or her pet indoors--especially owners of the Great Dane. This is one of the larger breeds of dogs, popularized in America by the Marmaduke cartoon series. For those with a little do-it-yourself knowledge, constructing a doghouse for the Great Dane will be somewhat of a challenge. In extremely cold climates you may want to consider adding insulation to the construction of the doghouse. If you live in an extremely hot climate, you may consider a small doghouse air conditioning unit. Calculate an appropriate size of doghouse needed. If your Great Dane is still a puppy, use his adult size approximation to construct the doghouse. Your dog will need to be able to turn around in the house and be able to get out of the wind and rain. Two pieces of 40" x 40" x 3/4" pine should serve well for the front and rear of the house. Label the first "Af" and the second "Ar". Measure 23 inches up from the bottom of the "Af" section. Use a long ruler and a pencil and draw a straight line across the piece at the 23-inch mark. Locate the center of the top of piece "Af" and make a small mark. Measure one and a half inches to the left and make a mark. Measure another one and a half inches to the right of the center mark and make a mark there. Draw a 45 degree angle line using a large ruler from the corner where the 23-inch line begins on the left to the mark you made on the top left in step 3. Repeat for the angled cut on the right side. Use this as a pattern and cut the second 40 by 40 panel ("Ar") to match. Measure one inch in from the right side and three inches off the bottom of piece "Af." Make a mark at that point and use a ruler to draw a straight line 25 inches long. Use a Dremel wood cutting tool and create an arch 18 inches high along the 25-inch line you just drew. This will be the Great Dane's doorway. Cut a 3/4" x 38 1/2" x 42 1/2" piece of plywood and label it "C." This will serve as the floor of the doghouse. Cut two pieces of 3/4-inch plywood to measure 42.5" x 23". Label these pieces "Bl" and "Br". These will be the sides of the doghouse. Secure the "Af" section to both the "Bl" and "Br" with wood glue and deck screws. One screw every half inch should be sufficient. Repeat this with the "Ar" section to form the rear wall. The wood glue will fill in spots that may not be flush and help keep cold air out. Secure these sections of the doghouse structure to the floor ("C"). Cut a 3/4" x 36 1/4" x 42 1/2" panel. Label it "D;" this will serve as an internal divider and as an internal brace support. Cut an arch in this panel the same size as the one you cut from section "Af." Set the arch in "D" toward the rear wall and secure it to the floor with wood glue and deck screws. Cut a piece of plywood 3/4" x 5" by 42 1/2". Label it piece "E." This will serve as an internal brace that will be secured to the top of the internal divider with wood glue and two-inch deck screws. Cut two more pieces of 3/4-inch plywood, one measuring 48" x 31" and the other one measuring 48" x 30 1/4". The first one label "F" and the second "G." These will be the left and right sections of the roof. Cut two roof gussets out of 3/4-inch plywood. They should measure 21 1/4" x 40" with the angle matching the angle of the sides "Af" and "Ar." Secure the first gusset to "G" and "F" using wood glue and deck screws. Repeat with the second one to form the angled roof. Set the roof down on top of the doghouse and secure in place to the gussets with wood glue and deck screws. Official Great Dane Guide: Do You Need a Large Dog House for your Great Dane? Roberts, David. "How to Build a Doghouse for a Great Dane." Sciencing, https://sciencing.com/build-doghouse-great-dane-7724882.html. 25 April 2017.